1909 On January 9th, the store was incorporated. That year coal silos were built and the store also began selling propane. A photo from that time shows the main supply barn with "Flour, Feed, Coal, Lumber, Hardware" painted across it. 1917 Income tax returns showed sales for the year of $120,635.79 with a gross income of $13,035.54 and expenses of $7,890.41. By contrast, today's annual sales are over $7,000,000! 1920 Henry W. Seeley, son of founder Powell G. Seeley, ran the the store until 1958 when he became ill.
1947 The Shepaug Railroad, which ran right next to the store, stops service. [See tracks in above photo at lower right.] Delivery of freight by railroad is replaced by trucking. 1950 The original two-story building was moved back 100 feet from Calhoun Street to make way for the one-story front addition. 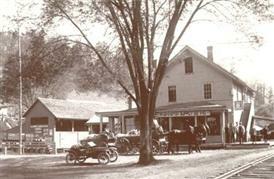 Although the store continued to operate during this period, the grand opening of the addition took place in May of 1951. 1955 The Flood caused $55,000 worth of damage to the store and its merchandise. Townsfolk pitched in to help clean up, and the store was open for business the day after the flood. 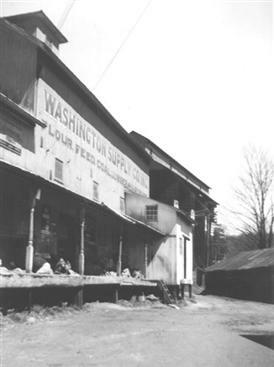 1956 Washington Supply, which owned many acres of land in the Depot, gave one-acre lots and sold more in the bargain to local folks who had lost homes or businesses to the flood. 1958 Henry Seeley retired and his son-in-law, Robert deCourcy took over, running the store for the next 27 years. 1960 Mildred Wright started working at the Supply. If you call the store today, chances are Millie will still answer the phone. 1971 Greg Seeley, representing the fourth generation of his family's stewardship of the store, took over as treasurer from his aunt, Helen Seeley deCourcy. After the sale of the Supply in 1976, Greg was general manger until 1983. Greg's son, Bryan, worked at the store for a couple of summers in the mid 90s while in high school, becoming the fifth Seeley generation to work at the Supply! 1973 Coal silos were torn down. 1976 The business was sold to Henry Paparazzo of Bridgewater, Curt McGann of Woodbury and Leon Farr. 1986 The store became computerized, making billing and inventory control more efficient. 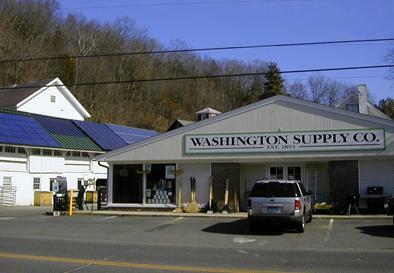 1993 The Washington Supply Company celebrated its 100th anniversary with a two-day, town-wide celebration. 2006 On September 28th, 2006, Mr. Henry Paparazzo transferred ownership of the company to a group of current employees. The group, consisting of Valerie Sedelnick, Jay Combs, Jim Bate, Tom Saunders and Bob Whelan was aided in the transaction by the oldest bank in Connecticut, The First National Bank of Litchfield (now Union Savings). 2010 January sees the completion of the 14.5 kilowatt combined building integrated photovoltaic and solar thermal array with 4 different types of photovoltaic equipment. This is the first such installation in the United States, and was completed by a collaboration between Washington Supply, Litchfield Hills Solar, Lenz Electric, Dawn Solar and JFS Custom Services. The project was funded in part by a grant from the Connecticut Clean Energy Fund. 2012 - 2013 We expand the Outdoor Living Department, adding 900 square feet of retail space to the existing 1,600 square feet. We also add 5 new storage facilities to keep our high quality lumber and plywood dry and snow free. As our customers have told us, this is "the most important change we've seen The Supply go through"! In 2012, Washington Supply purchased a Moffett Truck. Our drivers are now able to unload faster and safer to even the toughest job sites. 2014-2017 Two of the five owners retired from the business which leaves Valerie Sedelnick, Jay Combs and Jim Bate. They are always remodeling and making changes including putting in a new drainage system, changing floor plans (just to confuse the customers!). We acquired the Benjamin Moore line of paint and the full line of Marvin Windows. These additions have made our customers very happy! 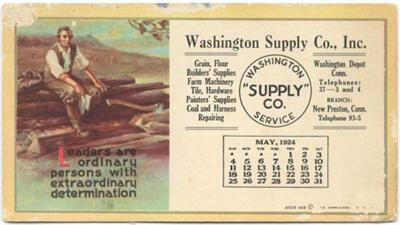 2018 Washington Supply will celebrate 125 Years! Plans are being made to celebrate! The original red barn (grey then) and loading dock. A 1915 Joseph West photograph, courtesy of the Gunn Historical Museum. 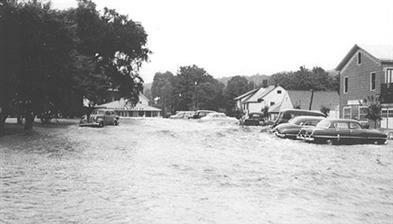 A view toward The Supply during the 1955 flood. A 1924 lithographed promotional desk calendar. A view towards our unique photovoltaic array. 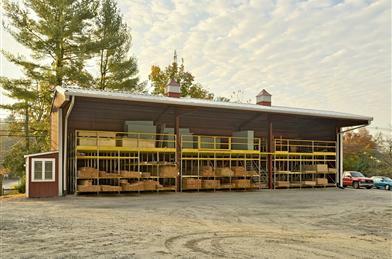 One of our new lumber storage buildings.